Virginia Woolf (née Stephen) (January 25, 1882 – March 28, 1941) was a British author who is considered to be one of the foremost figures of both Modernism and feminism in the twentieth century. Woolf is considered one of the most psychological of all the Modernists; many of her later novels take place entirely within her characters' heads, focusing exclusively on the literary technique known as stream-of-consciousness, which presents not an objective narration, but attempts to replicate the thoughts which shape the character's mind. Although she publicly despised James Joyce, her place in literary modernism resembles his more than any other contemporary writer. Like Joyce, Woolf was endlessly experimental in her literary technique, while each work she created had a style all its own, from the traditional narrative of Orlando to the high abstraction of The Waves. Woolf is one of the most enduringly popular of all the Modernists. While she liked to experiment with technique, she never abandoned a passionate commitment to storytelling. While some of the most intricately crafted stories in the literature, Woolf's works remain eminently accessible, unlike some of the other Modernists whom she disliked. Her biography betrays the best and worst in human relations. Even in taking her own life she wrote lovingly and affectionately to her husband and sister, expressing concern for them more than for her own life. How tragic is the loss of a sensitive woman and towering talent, arising at least in part from abuse and the shameful sexual deviancy of her half brothers. Born Adeline Virginia Stephen in London to Sir Leslie Stephen and Julia Princep Duckworth, Woolf was educated by her parents in their literate and well-connected household at 22 Hyde Park Gate, Kensington. Virginia's parents had married each other after being widowed and the household contained the children of three marriages: Julia's children with her first husband Herbert Duckworth: George; Stella; and Gerald; Leslie's daughter, Laura, from his previous wife; and Leslie and Julia's children: Vanessa Bell; Thoby; Virginia; and Adrian. Sir Leslie Stephen's eminence as an editor, critic, and biographer, and his connection to William Makepeace Thackeray (his previous wife was Thackeray's eldest daughter) meant that Woolf was raised in an environment filled with the influences of Victorian literary society. Henry James, George Eliot, George Henry Lewes, Julia Margaret Cameron (an aunt of Julia Duckworth), and James Russell Lowell, who was made Virginia's godfather, were among the frequent visitors to the house. Julia Duckworth Stephen was equally well connected. Descended from an attendant of Marie Antoinette, she came from a family of renowned beauties who left their mark on Victorian society as models for Pre-Raphaelite artists and early photographers. Supplementing these influences was the immense library at her home, from which Virginia (unlike her brothers who were formally educated) was taught the classics and English literature. According to her memoirs her most vivid childhood memories were not of London, but of St. Ives in Cornwall, where the family spent every summer until 1895. The family stayed in their home, called the Talland House, which looked out over the Porthminster Bay. Memories of the family holidays and impressions of the landscape, especially the Godrevy Lighthouse, informed the fiction she wrote in later years, most notably the early novel, To the Lighthouse. The sudden death of her mother from influenza in 1895, when Virginia was 13, and that of her half sister Stella two years later, led to the first of Virginia's several nervous breakdowns. The death of her father in 1904 provoked her most alarming collapse and she was briefly institutionalized. Her breakdowns and subsequent recurring depressive periods, modern scholars have asserted, were also induced by the child abuse she and Vanessa were subject to by their half-brothers, George and Gerald, which Woolf recalls in her autobiographical essays A Sketch of the Past and 22 Hyde Park Gate. Following the death of her father in 1904 and her second serious nervous breakdown, Virginia, Vanessa, and Adrian sold 22 Hyde Park Gate, and bought a house at 46 Gordon Square in Bloomsbury. There they came to know Lytton Strachey, Clive Bell, Saxon Sydney-Turner, Duncan Grant, and Leonard Woolf, the man she would later marry, who together formed the nucleus of the intellectual circle known as the Bloomsbury group. The group was rather informal and loosely-knit, but was committed to a number of diverse causes, among them modernism in the arts (the group famously introduced post-Impressionist painting to an English audience) and pacificism in politics. This group would tremendously aid Woolf as a source of support and criticism as she came into her own as a writer. 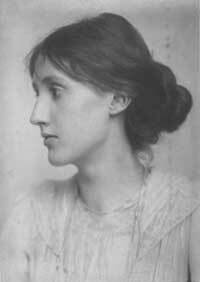 At the end of 1940 Woolf suffered another severe bout of depression, from which she felt she was unable to recover. On March 28, 1941, at the age of 59, Woolf filled her pockets with stones and drowned herself in the River Ouse, near her home in Rodmell. She left two suicide notes; one for her sister Vanessa, the other for her husband, Leonard: "I feel certain that I am going mad again: I feel we can't go through another of those terrible times. And I shan't recover this time. I begin to hear voices, and can't concentrate. So I am doing what seems the best thing to do. You have given me the greatest possible happiness… I can't fight it any longer, I know that I am spoiling your life, that without me you could work" (The Letters of Virginia Woolf, vol. VI, p. 481). 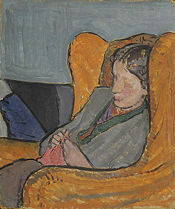 Virginia, painted by her sister Vanessa Bell, National Portrait Gallery. Woolf began writing professionally in 1905, initially for the Times Literary Supplement with a journalistic piece about Haworth, home of the Brontë family. Her first novel, The Voyage Out, was published in 1915 by her half-brother's imprint, Gerald Duckworth and Company Ltd. This novel was originally entitled Melymbrosia, but due to criticism Virginia Woolf received about the political nature of the book, she changed the novel and its title. This older version of The Voyage Out has been compiled and is now available to the public under the intended title. She went on to publish novels and essays as a public intellectual to both critical and popular success. Woolf is considered one of the greatest innovators in the English language. In her works she experimented with stream-of-consciousness, the underlying psychological as well as emotional motives of characters, and the various possibilities of fractured narrative and chronology. In the words of E.M. Forster, she pushed the English language "a little further against the dark," and her literary achievements and creativity are influential even today. Woolf's reputation declined sharply after World War II. Her work was criticized for epitomizing the narrow world of the upper-middle class English intelligentsia, peopled with delicate, but ultimately trivial, self-centered, and overly introspective individuals. Some critics judged it to be lacking in universality and depth, without the power to communicate anything of emotional or ethical relevance to the disillusioned common reader, weary of the 1920s aesthetes who seemed to belong to an era definitely closed and buried. Her eminence was re-established with the surge of Feminist criticism in the 1970s. After a reversal of fortunes caused by accusations that Woolf was anti-semitic and snobbish, it seems that a critical consensus has been reached regarding her stature as a novelist, and Virginia Woolf is now recognized as being among the greatest of twentieth century writers. As in the fiction of Henry James, it is a mistake to dismiss Woolf because of her subject matter. Although Woolf takes the upper-class London society with which she was most familiar as her subject-matter, the goals of her work, concerned as they are with the nature of mind and soul, are universal. Virginia Woolf's peculiarities as a fiction writer have tended to obscure her central strength: Woolf is arguably the major lyrical novelist in the English language. Her novels are highly experimental: A narrative, frequently uneventful and commonplace, is refracted—and sometimes almost dissolved—in the characters' receptive consciousnesses. Intense lyricism and stylistic virtuosity fuse to create a world overabundant with auditory and visual impressions. The intensity of Virginia Woolf's poetic vision elevates the ordinary, sometimes banal settings of most of her novels, even as they are often set in an environment of war. For example, Mrs. Dalloway (1925) centers on Clarissa Dalloway, a middle aged society woman's efforts to organize a party, even as her life is equated with Septimus Warren Smith, a soldier who has returned from the First World War bearing psychological scars. To the Lighthouse (1927) is set on two days ten years apart anticipating and reflecting on the Ramsay family's holiday and the family members' interlocking tensions resolved in a visit to a lighthouse. And yet the novel also meditates on the lives of a nation's inhabitants in the midst of war, of the people left orphaned and alone by destruction and violence. The Waves (1931), arguably the most ambitious and difficult of all Woolf's novels, presents a group of six friends whose reflections (closer to recitatives than to the interior monologues proper) create a series of waves and ripples in the stream of consciousness—the thoughts of each character rebounding off the others—resulting in a book that is more akin to a prose poem than to a novel with a discernible plot. Mrs Dalloway is arguably Woolf's greatest novel, and certainly her most enduringly popular. Chronicling the events of a single day in London, the book is seen as Woolf's highest achievement as a Modernist author, utilizing the effects of stream-of-consciousness narrative masterfully to achieve a story of psychological depth that is nevertheless readily readable. The novel follows Clarissa Dalloway throughout a single day in post-Great War England. Constructed out of two short stories that Woolf had previously written ("Mrs Dalloway in Bond Street" and her unfinished "The Prime Minister"); the plot of the story is deceptively simple: The novel follows Clarissa throughout her day as she prepares to host a party later in the evening. Interspersed with Clarissa's story are chapters told from the perspective of Septimus Warren Smith, a shell-shocked war veteran who has seen the horrors of World War I; as the day drags on, Septimus falls deeper and deeper into depression and ultimately commits suicide by leaping from a window. Using the interior perspective of the novel, Woolf moves back and forth in time, and in and out of the various characters' minds to construct a complete image, not of just Clarissa's life, but of the entire social scene of England in the first decades of the twentieth-century. Because of structural and stylistic similarities, Mrs Dalloway is commonly thought to be a response to James Joyce's Ulysses, a text that is commonly hailed as one of the greatest novels of the twentieth century. Woolf herself derided Joyce's masterpiece, even though Hogarth Press, run by her and her husband, initially published the novel in England. The novel itself is preoccupied with a number of issues, most notably madness and the role of women in society, seen through the minds of Clarissa and the novel's other protagonist, Septimus Warren Smith. As a commentary on Edwardian society, Clarissa's character highlights the role of women as the proverbial "Angel in the House" and embodies both sexual and economic repression. Septimus, as the shell-shocked war hero, operates as a pointed criticism of the treatment of insanity and depression. Woolf lashes out at the medical establishment through Septimus's decline and ultimate suicide. Similarities between Septimus's condition and Woolf's own struggles with manic depression (they both hallucinate that birds sing in Greek, and Woolf once attempted to throw herself out a window as Septimus finally does) lead many to read a strongly auto-biographical aspect into the character of Septimus. Adopting the plot device used by James Joyce in Ulysses, the narrative present of Mrs. Dalloway is patterned as the sequence of a single day in June. The novel opens conventionally enough with the sentence, "Mrs Dalloway said she would buy the flowers herself." This single event, however, launches us into Clarissa's mind, and what follows is a plunge into Clarissa Dalloway's past, as the flowers trigger her memories of the open air at Bourton where she spent her adolescence long before she became Mrs Dalloway. Her recollection of that time leads her to think of Peter Walsh, a man with whom she was enamored, as he was at that time. A paragraph later, Clarissa is back in the present, waiting for Durtnall's van to pass so that she can cross the road to buy the flowers. It is already apparent from these opening paragraphs with the fluidity of movement between past and present, which softens and blurs the lines of their traditional opposition, that Woolf's technique treats the past as intimately involved with the present. The past is not just treated as a background for the present, it becomes a part of it by virtue of Clarissa's association of the freshness of the June morning with Bourton and Peter. Woolf's novel is, like so many modernist novels, concerned extensively with reconciling the optimism of the present with the horrifying past of the Great War. “I will come,” said Peter, but he sat on for a moment. What is this terror? what is this ecstasy? he thought to himself. What is it that fills me with extraordinary excitement? "The Mark on the Wall"
Read her literature at online-literature.com. Works by Virginia Woolf. Project Gutenberg. This page was last modified on 22 January 2016, at 17:10.